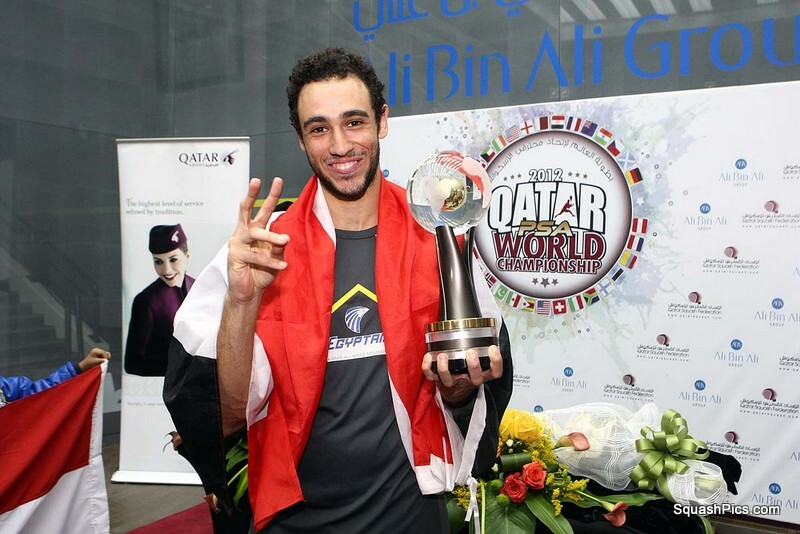 In a sensational all-Egyptian clash which went to the wire, Ramy Ashour triumphed over outsider Mohamed El Shorbagy in the final of the Qatar PSA World Squash Championship at the Khalifa International Tennis & Squash Complex in Doha to become world champion for the second time since 2008. Ashour, who 24 hours earlier dethroned England’s defending champion Nick Matthew to ensure his status as world number one next month, had to be at his best to see off his 21-year-old opponent, the youngest player in the PSA world top 25. 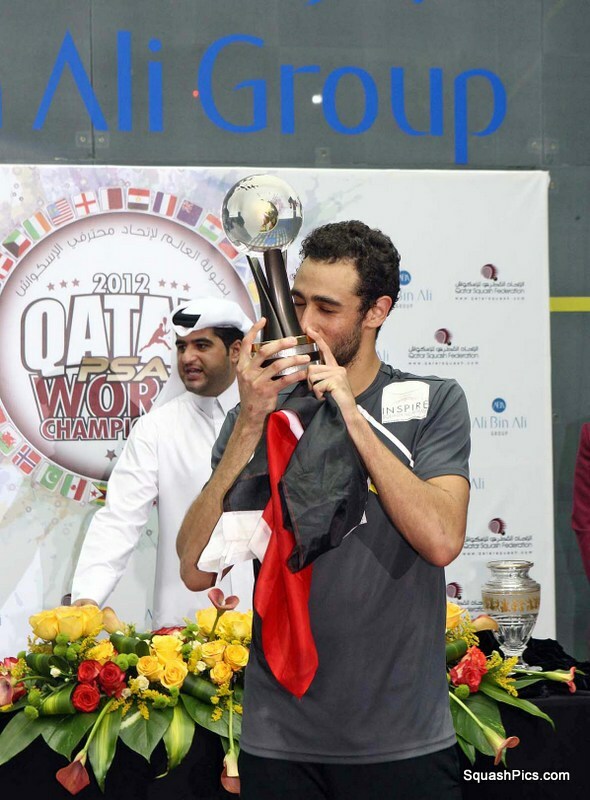 The final brought to a magnificent climax the premier PSA World Tour championship which boasts a $325,000 prize-fund, the second biggest in the sport’s history, and was being hosted by Qatar for the third time since 1998. 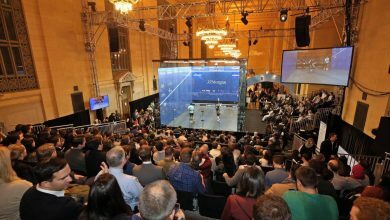 Eighth seed El Shorbagy, who upset England’s world number James Willstrop in a 112-minute semi-final, got off to an excellent start – romping from 4-2 up to win the opening game in a single hand in just 10 minutes. It was the first game the youngster had taken off Ashour after two 3/0 defeats since 2009. Ashour, who was clearly not yet in the match, stayed on court throughout the break before the second game – trying to refocus himself for the next stage. The tactic clearly worked as the fifth seed and 2008 champion recovered from the loss of the first two points in the game to build up an 8-4 lead. Underdog Shorbagy, the world number six from Alexandria, clawed back two more points – but Ashour drew level to forcefully mark his return to the match. 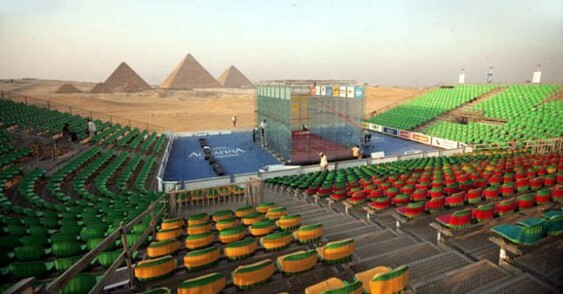 Shorbagy’s response was to demand a new ball and promptly returned to the court before his opponent to warm it up for the third game. It was he who took the early advantage, but Ashour again resumed control, reeling off seven points in a row en-route to taking the game and moving 2/1 ahead. The effect of Shorbagy’s near-two-hour-long semi looked to be taking its toll – but the world final debutant refused to surrender to his experienced fellow countryman. 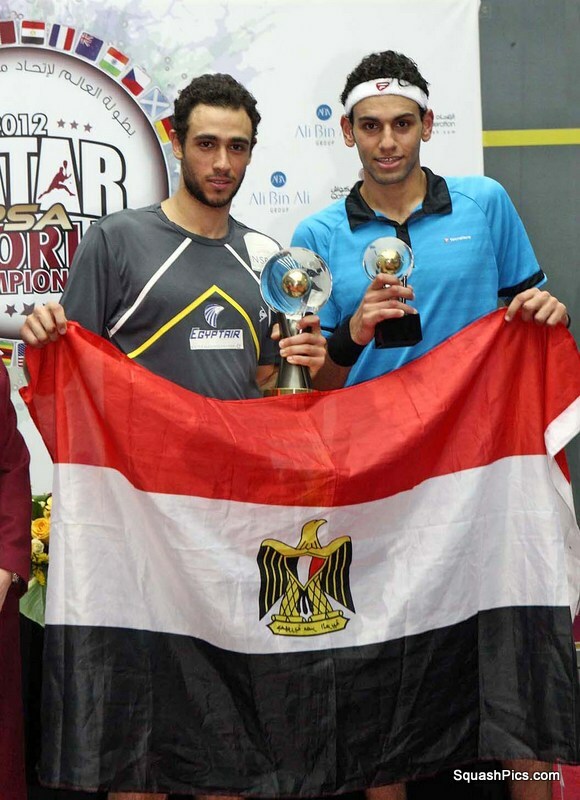 Shorbagy led 4-1 and 7-4 in the fourth – but from 5-8 down, Ashour pulled the game back to nine-all, just two points away from the title. 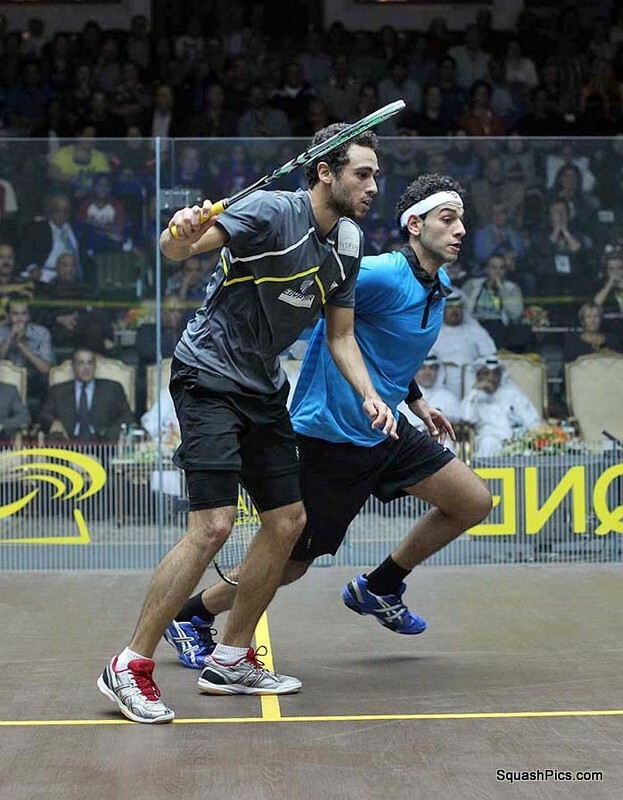 Shorbagy responded in fantastic style, surviving what PSA SquashTV commentators Joey Barrington and Paul Johnson called “an outrageous rally”, to get to match-ball – which he duly converted to take the climax into a fifth game decider. “The final has truly come alive,” added Barrington. 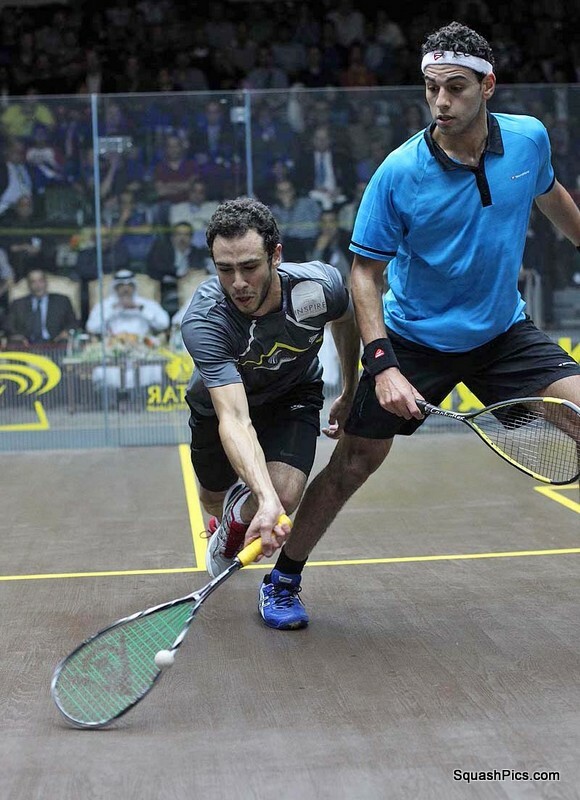 It was nip and tuck through the fifth – Ashour leading 4-1 and 7-5 before Shorbagy clawed back to eight-all. An unforced error by Shorbagy, followed by a stroke against the underdog, took Ashour to his first match-ball. Within seconds Ashour had converted his advantage – and the beaming 25-year-old from Cairo bent down to one of the camera positions in the court’s front wall to kiss the TV camera lens! “I am very, very, very glad I have won this title,” said new world champion Ashour after his 2-11, 11-6, 11-5, 9-11, 11-8 victory in 90 minutes. “But what makes me most happy is that I have done this after coming back from injury. “Mohamed – he was amazing today. “I’m really proud of the fact that this was an Egypt final,” added Ashour. 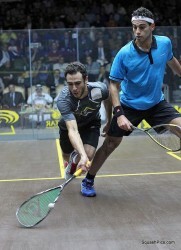 Barrington added: “Nobody would have thought that Mohamed would take Ramy all the way to the wire.